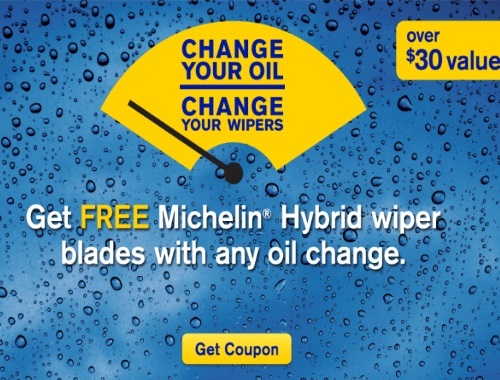 Mr Lube is offering Free Michelin Hybrid Wiper Blades with any oil change package with the coupon below! That's a $30 value! Offer is valid until October 30, 2016 or while quantities last at participating locations. Please note, Michelin blades are not available at Mr. Lube in Walmart locations. An alternative wiper/oil offer available at these locations. Click here to get the coupon for Free Wiper Blades.